When it comes time to add to the insulation of your home, you have a number of choices as there is Batt Insulation, Spray Foam, but this post is about the benefits of blown insulation. 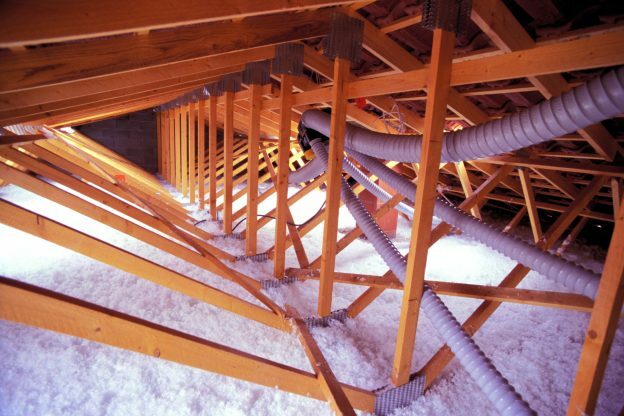 If you choose blown insulation, you will experience the following benefits. One of the benefits of blown insulation when compared to types like fiberglass batts, is that blown insulation is more efficient. Because loose-fill insulation is a monolithic layer of insulation without seams like are found in batts, studies have shown that loose-fill insulation performs up to 22% better than batts of the same R value. These are just a few of the many benefits of blown-in insulation. To learn more, contact Safe-R Insulation to get a free quote. Safe-R Insulation believes that excellence in every step of the process ensures timely completion and quality service, time after time after time. This entry was posted on August 18, 2015 by Wade Maurice. Glasswool and Mineral Wool are the only non – combustible insulation and can act as a fire barrier. For recessed lights we specify XLP protectors around every light. Jet Stream Max is a non combustible material and is fire retardant. Jet Stream Max mineral wool insulation will not exceed the Gib 2010 Guide maximum weight until R10, so is suitable for most gib board or plaster ceilings. The most critical factor for safe, long-term performance is a correct installation system. Jet Stream Max is a proven performer since 1995. Jet Stream Max insulation is extremely durable and has a life expectancy of over 50 years! Quite simply Jet Stream Max ceiling insulation works to keep the outside temperature out and the inside temperature in! Think of it like a lid on a chilly bin or vaccuum flask, if you put hot food in it stays warm and if you put cold food in it stays cold. It works to stop/slow temperature transfer. The better the insulation grade or type of insulation product you use the less temperature transfer there is, so the better the insulation works. Inadequate ceiling insulation and air leakage are leading causes of energy waste in most homes.